David Davis has told Conservative MPs the UK’s whole approach to negotiations with the EU risks being undermined by amendments to its flagship Brexit bill. The Commons will vote later on whether to give MPs a decisive say on any final deal struck with the EU in the autumn. Mr Davis said Parliament would be involved in the process but could not undo the 2016 EU referendum. The government was hit by a resignation ahead of the votes, with Phillip Lee saying Parliament was being sidelined. The justice minister announced he was quitting over the Brexit strategy being pursued and that he could not support “how our country’s exit from the EU looks set to be delivered”. MPs are gearing up for two days of votes on changes made by the House of Lords to the EU Withdrawal Bill. The most tightly-contested amendment is expected to be a call for Parliament to decide what happens next if it does not like the UK-EU Brexit deal. The action in the House of Commons is due to start soon. Phillip Lee has been a junior justice minister since July 2016, having first been elected as the Bracknell MP in 2010. Explaining the reasons for his resignation, he cited the government’s opposition to the “meaningful vote” amendment, saying this position “breaches fundamental principles of human rights and Parliamentary sovereignty”. He also raised concerns about the economic impact of leaving the EU, saying Brexit had turned out to be much more complicated than first thought. The UK should “pause, extend or revoke” the Article 50 process which formally triggered its departure from the EU, he said, calling for another referendum once ministers’ chosen path becomes clear. Pro-EU campaigners hailed his resignation as significant in their calls for a referendum on the UK and EU’s final Brexit deal. Mr Duncan Smith said the amendment giving more power to Parliament would be “disastrous” and allow the House of Lords to “block the whole passage of Brexit”. BBC political editor Laura Kuenssberg said the numbers were still “rather dicey” for the so-called meaningful vote amendment. 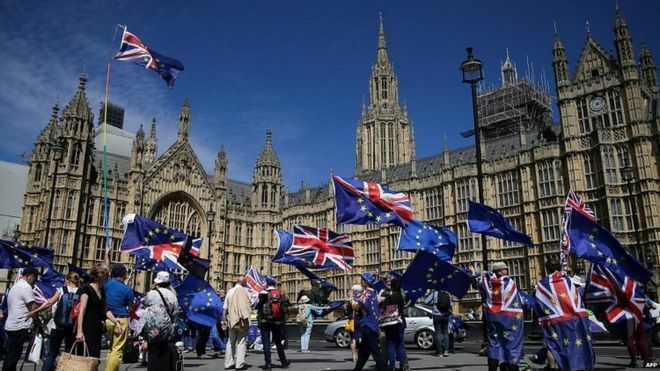 It would mean ministers “must follow any direction” set by a House of Commons motion if Parliament rejects the final Brexit deal or negotiations run out of time. The government says this would bind the UK’s hands in the negotiations. Speaking on BBC Radio 4’s Today programme, Mr Davis said a Parliamentary vote on the Brexit deal did not give “the ability to reverse the decision of the referendum”. Asked what would happen if MPs rejected the deal, he said there would be no time to restart negotiations, with the UK leaving the EU in March 2019. “If they throw it out, well they throw it out,” he said. Rebels have dismissed the government’s amendment, a commitment by ministers to make a statement within 28 days should MPs vote down the package negotiated by Mrs May. A showdown over customs seems to have been averted after a compromise amendment was accepted by the government – which means it has agreed to report to Parliament by October on efforts to negotiate a “customs arrangement” with the EU after Brexit. The fallback position has won the backing of a cross-section of leading Tory MPs on either side of the Brexit argument, avoiding for now a showdown over calls – backed by the House of Lords earlier this year – for the UK to remain in a fully-fledged customs union with the EU after it leaves. Mr Davis said a “great deal of progress” had been made in negotiations, saying he was expecting both a withdrawal agreement and the “substance” of the UK and EU’s future relationship to be finalised in October. He also described as “nonsense” reports he threatened to resign over the wording of last week’s “backstop” plan to avoid border checks in Northern Ireland. The EU withdrawal bill is the legislation aimed at ensuring the UK has a smooth transition out of the EU, and will mean EU law is no longer supreme in the UK. To avoid a sudden “cliff edge” on Brexit day, 29 March 2019, it would also convert existing EU law into UK law so the government and Parliament can decide at a later date which bits they want to keep or change. The House of Lords has put forward 15 specific changes to the bill, but the government wants to kill off most of these changes. However, numbers in the House of Commons are finely balanced, with the Conservatives not having a majority and needing the help of Northern Ireland’s Democratic Unionist Party to get their way. On Monday, Mrs May told her MPs they “must think about the message Parliament will send to the European Union this week”. “I am confident I can get a deal that allows us to strike our own trade deals while having a border with the EU which is as frictionless as possible,” she said. Labour, which is backing 14 out of the 15 amendments, is urging Tory rebels to seize the chance to “decisively shape the course of the negotiations”. Jeremy Corbyn’s party is also divided on Brexit, with several MPs unhappy Labour is not backing a bid to keep the UK part of the EU’s single market, like Norway. There is still a chance of a squeaky moment for the government, or having to rely on votes from some Labour MPs, on a move to give Parliament more power if MPs vote to reject the final Brexit deal. Sources tell me the numbers are still rather dicey for that so called “meaningful vote” amendment that will take place tomorrow. There are discussions ongoing among potential rebels about whether they should deploy their forces. Some of them believe, as they do on the customs issue, that they have the numbers to beat the government if they decide it’s the right moment. Appeals for party unity in the last couple of days, and the compromise on customs seem to have had some sway.